Poorly disguised as two “predator control studies” aimed at increasing sport-hunting opportunity for mule deer over the coming years, the state is putting bears and cougars in the crosshairs. The first plan calls for trapping and killing between 15-45 cougars and 30-75 black bears over a period of three years. They want to kill native bears and cougars so that more people will pay to hunt and kill mule deer other animals. Join us in telling our state’s wildlife managers it is past time to put wildlife first. Tell Colorado Parks & Wildlife native carnivores belong in Colorado. The State has a new plot to kill cougars and bears in an attempt to boost mule deer populations so that it can sell more hunting tags. Yup, that’s right, they want to kill native animals so that more people will pay to kill other animals. Join us in telling our state’s wildlife managers it is past time to put wildlife first. Poorly disguised as two “predator control studies” aimed at increasing sport-hunting opportunity for mule deer over the coming years, the state is putting bears and cougars in the crosshairs. The first plan calls for trapping and killing between 15-45 cougars and 30-75 black bears over a period of three years. The “study” part is a post-killing analysis of the impact of removing native predators on mule deer fawn survival rates. The science shows that removing native carnivores from the landscape undermines ecosystem functions. Adding insult to injury, the state plans to have the federal government’s rogue wildlife killing program—Wildlife Services—do the dirty work by setting cruel and indiscriminate traps and using hounds to capture the bears and cougars before shooting them dead. So, both your state and federal public resources would be used for the killing. And, as if one so-called “research” project wasn’t good enough, another is set to begin this year. This second cruel project allows for dramatically increased trophy hunting of mountain lions over a nine-year “study” period. Fully six years of the study involve increasing cougar harvests by 50% to purposefully suppress the population. The “study’s” goal is to analyze the impact of using sport-hunting to control the wildcat population and increase deer density. Again, state sponsored killing of one native species purportedly to benefit hunters trying to kill another. Killing Colorado’s native carnivores to benefit sport-hunters is just plain wrong. It’s also biologically unsound. Please join us in speaking out for Colorado’s wildlife and thriving natural ecosystems. Help us talk some sense into our state’s leading wildlife managers. The State is hosting a public listening session on September 19th from 6:30 to 8:30p at the Hunter Education Building in Denver (6060 Broadway). Join Guardians in showing your support for Colorado’s native carnivores by attending and sharing your thoughts on the State’s proposed “research” plans. Coloradans are proud of the healthy, wild ecosystems that make the state unique. Don’t let bloodthirsty minority interests destroy the balance for us all. 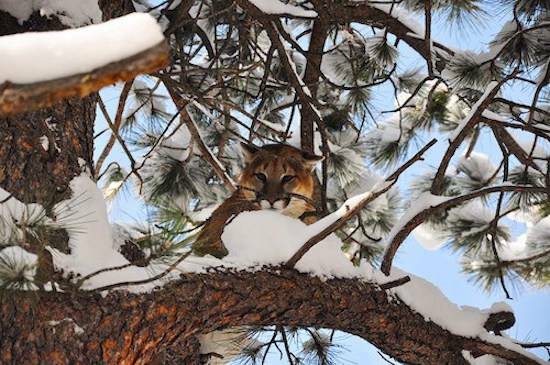 Tell Colorado Parks & Wildlife native carnivores belong in Colorado.